Have you ever had a lucky photograph? I did recently when taking photos of a white Rose of Sharon Hibiscus shrub. As I pressed the shutter button, a hummingbird flew into the picture almost as if it wanted its picture taken. I was so pleased with this happy occurrence, it inspired me to do this painting. The original of this painting is sold. 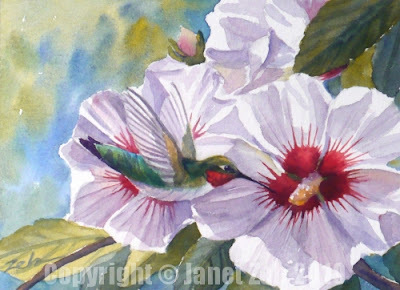 Check my Etsy shop for currently available bird paintings or let me know if you'd like a print. Thanks for stopping by and hope you have some happy surprises today.